Since immigrating to the United States of America in 2010 and being sponsored in 2016 for his extraordinary abilities as a musician, the enchanting and dexterous cellist, Steve Kramer, has proven to be one of the most prominent and colorful musicians of today, ascending into classical music’s highest class of performance and musical education. His silvery, singing tone, perspicacious intelligence, musical inquisitiveness and charismatic personality have led him to build memorable bridges to his audience while exploring versatile repertoire from the four corners of the world. His childhood experience studying the art of chamber music with Yehudi Menuhin and Peter Norris has most certainly contributed a significant element to his enlightening style and the invigorating and very expressive musical individuality that distinguishes his playing and teaching. Steve Kramer is the award-winning recipient of the internationally prestigious Jacob Gade Foundation’s 36th Grand Prize. The prize supports an outstanding musician who possesses progressive and penetrating musicality and pizzazz and who desires to have a life-long career as a major international artist and performer. Since receiving the award in 1998, Steve Kramer has collaborated with composers from all over the world. In the near future he will perform contemporary music by composers, David Finko, Ben Steinberg, Daniel Dorff, Sidney Grolnic, Eleonor Sigal and Cynthia Folio as well as compositions by Scandinavian composers and composer who lost their lives in World Wars I & II. Furthermore, Steve Kramer was awarded the 1994 Bernhard Rosenfeld Foundation Artist Prize, supporting outstanding musical children from families who emigrated from the former Soviet Union. In addition, he was awarded the Talent Prize and Gold Medal at the national music competition, the Berlingske Music Competition, in Copenhagen, Denmark, and garnered an Artist Prize given by Pope John Paul II in Orvieto at the Orvieto Musica festival in Italy. Numerous Danish foundations, including the Augustinus Foundation, the Royal Danish Family and English benefactors, generously subsidized Steve Kramer’s early education. 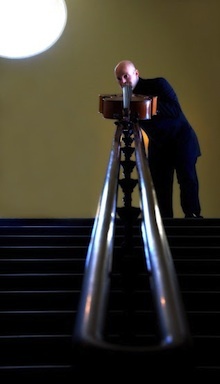 In the 2014-15 season, Steve Kramer made his appearance as a soloist and chamber musician at the Barnes Foundation and the Kimmel Center in Philadelphia. His recent invitations by patrons continuously bring Steve Kramer to Europe. In the U.S. Steve Kramer will continue his passionate involvement with educating less privileged young people. He will emphasize the utmost importance of training children in classical music as part of their academic education. Children born into poverty receives free of charge lessons in his local community. In 2012-13 Steve Kramer debuted at the Kimmel Center’s Verizon Hall and Perelman Theater and the Philadelphia Art Museum. Internationally, Steve Kramer has worked with such prominent European orchestras and chamber ensembles as the Yehudi Menuhin Orchestra, led by violinist Yehudi Menuhin; the Detmold Chamber Orchestra, led by violinist Tibor Varga; the Malmo Music High School Orchestra, led by violist Josef Kodousek, and the Royal Danish Symphony Orchestra, Danish National Symphony Orchestra, Amsterdam Symphony Orchestra and ensembles and orchestras in the Netherlands, France and Germany. He has also performed chamber music and recitals all over Scandinavia, in the Concertgebouw and Hermitage in Amsterdam, the Netherlands; the Wiener Musikverein, in Vienna, Austria; Barbican Hall, Royal Festival Hall and Wigmore Hall in London, England; and Le Corum in Montpellier, France. Steve Kramer has performed as soloist or chamber musician for and received artistic direction from violinist Isaac Stern, cellist Mstislav Rostropovich, violinist Maricio Fuks, violin pedagogue Milan Vitek, cellist Vladimir Chevel, cellist Heinrich Schiff, and members in the Alban Berg Quartet, the Amadeus Quartet and the Borodin Quartet. He has extensive experience playing in orchestras led by conductors such as Gennady Rozhdestvensky, Yuri Temirkanov, Kurt Masur, Bernhard Haitink, Neemi Jarvi and Mikhail Jurowski. Steve Kramer has appeared at festivals such as the International Kammermusik-Akademie Kronberg in Taunus, Germany; the Manchester International Cello Festival RNCM, in England; the Cervo Music Academy and Orvieto Musica in Italy; La Fete de la Musique in Nice, France; Festival de Radio France in Montpellier, France; the Jeunes Prodiges Au Palais in La Grand Motte in France; and in Ajacio, Bonifacio and Porto Vecchio, Corsica. Steve Kramer has also worked for composer Andrew Lloyd Webber and adventurer and film-director Ivars Silis. He received artistic guidance and inspiration from Martha Casals, chamber music pedagogue, Tim Frederiksen and composer Ib Norholm. An American immigrant since 2010, Steve Kramer now devotes all his time in the United States, where he has been a most active performer of the cello and violin repertoire. He is working part time as an educator in music as well as the Director of Music at the Centre Theater in Montgomery County, where he is a proud member of Valley Forge Tourism & Convention Board. Steve Kramer continues developing his artistic collaboration with the young generation of America, teaching emerging young artists from across the world and passionately devotes much of his time teaching underprivileged youth and bringing regular performances to the sick and infirm. Steve’s more recent endeavors involves teaching at a number of organizations including Philadelphia Youth Orchestra and Musicopia. Steve Kramer collaborates with Richard Calassini and Cunningham Piano Company and portrays chamber music in a myriad of ways having established numerous ensembles, many of who are recognized as leading ensembles. As part of an old European tradition of sharing the musical arts in intimate settings with friends and families; Steve Kramer makes great emphasis on performing chamber-music concerts, most recently at ‘Music at Lake Barcroft’, in collaboration with Dominic Cardella. In 2018/19 the Rachmaninoff Duo will promote American and Danish compositions internationally. Most recent invitations bringing the ensemble to Brazil, São Carlos, São José dos Campos and Piracicaba. The artistic collaboration-series contains both recitals and master-classes, sharing the heart of America in music, honoring outstanding composers such as the great George Gershwin and Leonard Berstein, in celebration of his 100th anniversary.